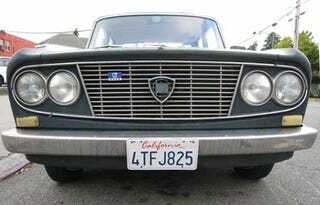 This is a daily-driven commuter '66 Lancia, parked on the street in Alameda. Let's just pause and contemplate the meaning of that statement: here is a man who depends on a 41-year-old Lancia Fulvia for his everyday transportation! Your 400,000-mile Toyota commuter doesn't seem so daring now, does it? The owner of this car has a similar commute to mine, so I've been seeing it regularly for years. It drives on the Nimitz Freeway. It parks on city streets. It's a little rough, and no doubt is a veteran of thousands of roadside repairs (how many tools and spare parts do you suppose are in that trunk right now? ), but it has outlived 99% of all the other 1966 cars ever built. Oh yeah, it's Italian. Even the hubcaps have style! The '66 Fulvia Berlina GT had an 80-horse V4 and could hit 60MPH in 15.7 seconds, which seems glacial by today's standards but was actually on the zippy side for little 4-banger sedans back then. Check out how the license plate has been trimmed to fit the Italian-size frame. The interior is on the beat side, but everything is there. Hey, it's got a four-on-the-tree shifter! How can you not love an old Italian front-wheel-drive 4-door with four-on-the-tree? And dig that crazy speedometer! Nice square in-dash tach, too. Think both of them work? Once again, it's got Italian style galore. Not only that, it sounds mean to boot. I want a Lancia now!